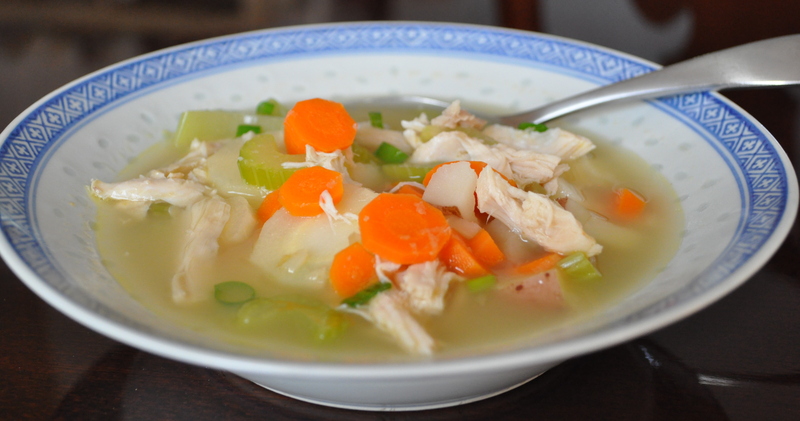 This is one of my favorite soup recipes. Aside from the fact that I love fresh ginger, it also first came to me from a friend delivering dinner to our house when I was sick. We hadn’t lived in Utah all that long and while I greatly appreciated a wonderful home-made dinner delivered with love, it was a totally foreign concept to me. Someone was making dinner for us simply because I was sick? Should I let them do that? Or was it one of those offers you are supposed to politely refuse? It was one of my first lessons in how life is different outside the state of California. To be fair, no one brought me meals when I was sick in Seattle or Phoenix either, but I was in college in those years…no one parts with a cent of food in college! So, what was up with California? It may be that I didn’t know enough people for anyone to offer such a thing. I lived in small towns and there were very few people my age. Or maybe people are just busier so no one has time for making meals for others outside of a death in the family. Or maybe generosity is just becoming a lost art in our culture in general. Whatever the reason, it feels like people take care of each other more here in Utah. I don’t think I’ve been sick once without someone offering help of one kind or another. Running errands, take the kids for you, make a meal, people here are just generous with their time and resources. They are eager to use both to be a blessing to others. Anyhow, Jenny, a new friend at the time, opened my eyes to the sheer joy that can be brought to a family by simply bringing them a meal. So this soup has a special place in my heart. I have been on the mend from being sick recently and this is the first meal I wanted upon recovery. The recipe is originally from Real Simple magazine. I have modified it to what veggies our family likes best. Feel free to do the same. This recipe is easy, fast, delicious, and healthy. It calls for shredded rotisserie chicken which I almost always keep on hand in the freezer. Rotisserie chicken is one of the best grocery store deals out there. It would cost you more to buy, prepare, and roast a chicken yourself than to pick up one of the pre-made chickens in the store. Not to mention the time and work you are saving yourself. Alternatively, bake an extra chicken breast or two the next time you are having chicken and shred the extras to keep in the freezer. It makes soup-making quick and easy when you’ve got it on hand. Whether you’re sick and in need of comforting goodness, or you’re looking for a great meal for a cold fall or winter evening, this soup hits the spot! Heat the oil in a large saucepan or Dutch oven over medium heat. Add the garlic and ginger and cook, stirring, until fragrant, 1 to 2 minutes. Add the broth. 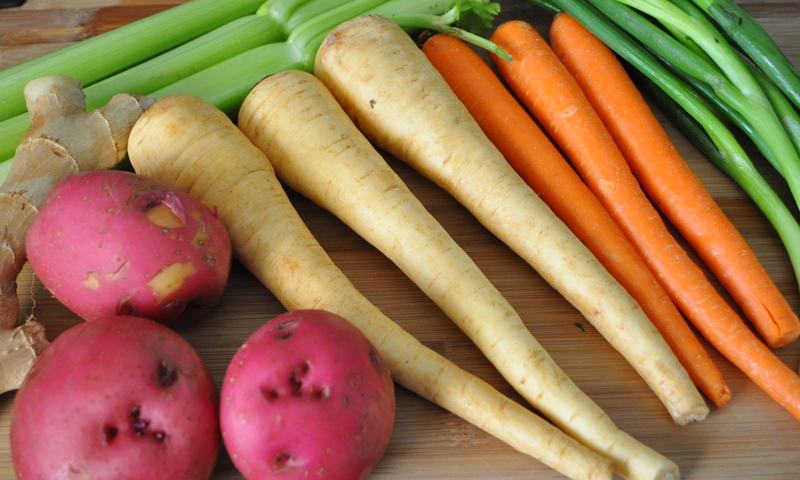 Stir in the parsnips, carrots, celery, potatoes, and ½ teaspoons salt. Bring to a boil. Reduce heat and simmer until the vegetables are tender, 15 to 20 minutes. Add the chicken and scallions to the saucepan and cook until heated through, 3 to 4 minutes. Feel free to make some for a friend! Love you too Jenny! Thanks for the great recipe! Oh how I have to make this!! I love a good dose of ginger when feeling under the weather or just chilly. This sounds so delicious! Sarah, we woke up this morning to an unexpected 4 inches of snow, took an hours or so trail hike in the snowy woods and returned with the single minded goal of making this soup to warm up. I had it pretty well built up in my expectations and it did not disappoint! Exactly what I was hoping for on this snowy Saturday! The ginger gave it just enough warmth and flavor and the parsnips (which I am partial to anyway) gave it the hint of sweetness. Perfect! This one’s a winner in my book.